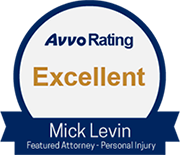 The Phoenix personal injury lawyers at Mick Levin, PLC have the experience you need in handling complex personal injury cases. A personal injury lawyer works with clients who have suffered a physical or emotional injury, usually by accident or mistake. They cover cases such as car accidents, botched surgery, and harassment. Personal injury resulting from someone else's negligence or recklessness can incur costly medical bills and property repairs. Some severe accidents may cause invaluable damages to victims that are simply too great to carry a price tag, such as the loss of a loved one. Personal injury attorneys know how the insurance claim process works, they know what evidence to gather, and they know how to calculate and present a claim for damages. Many personal injury attorneys take cases on a contingency basis, which means they receive an agreed-upon percentage of the payment you receive, also called the personal injury settlement. If you don't recover any money, they don't get paid their fee. Personal injury lawyers also know how to defend you if someone thinks an injury is your fault. Not all personal injury law firms in Phoenix are the same. Make sure that the firm you choose has actual experience in handling cases that are somewhat similar to yours. If you live near Phoenix, Arizona and are in need of a compassionate, experienced personal injury lawyer, Mick Levin, PLC may be able to help you. If you are a victim of alcohol-related injury, insurance claims, prodict liability, professional negligence, dangerous prescription drugs, state liability claims, abuse or neglect of a child or vulnerable person, or have a family member that is, please call us. Below are factors to consider when deciding upon a personal injury law firm in Phoenix, Arizona. Comfort Level - Are you comfortable telling your lawyer personal information? Does your lawyer seem interested in solving your problem? Practice Areas - Has your lawyer worked on other cases similar to yours? The lawyers at Mick Levin, PLC only represent victims, and have done so with great success. Cost - What are the costs involved in handling your case? At Mick Levin, PLC, you pay absolutely nothing unless we win your case. Location - Is your lawyer's office conveniently located? We service the city of Phoenix, and the entire state of Arizona. Trial Experience – Although any lawyer could take a case to trial, very few actually do. The opposing side often knows this and they will try to settle a case for far less than what it is worth. At Mick Levin, PLC, our personal injury lawyers in Phoenix mean business. Whenin the best interest of our clients, we will not hesitate to take a case to trial. Mick Levin, PLC was founded in Arizona with the desire to obtain justice for victims. IMPORTANT NOTICE AND DISCLAIMER: Internet e-mail communications should not be employed for the transmission or submission to our offices of confidential, proprietary or otherwise sensitive information. When e-mailing us, please note that your communication with us through this website and e-mail does not constitute or create an attorney-client relationship with Mick Levin, PLC. Unless you are an existing client of Mick Levin, PLC any information you send to Mick Levin, PLC by e-mail will be on a non-confidential and non-privileged basis.